July 24, 2016—There are big rumblings in Sacramento about the Off-Highway Division of State Parks. State Parks has been under scrutiny the last few years. It started when the state was having financial trouble (2011) and State Parks was asking for more money to keep from closing parks. An audit found State Parks had $54 million hidden away, which caused a public outcry. Why is Parks asking for more money when they have so much squirreled away? Part of that $54 million was $33.5 million in OHV money that was designated for new acquisitions. So no, that money was not available for State Parks to use as it saw fit. Even though the money (at least the OHV portion) was legitimately designated, there was political fallout. Head of Parks Ruth Coleman and OHV Director Daphne Greene were removed from their posts. Daphne was especially well-liked as a champion of OHV and is still sorely missed. The Governor recently created a commission to look at State Parks and make recommendations about operations and cost savings. One of their recommendations is to dissolve the OHV Division and merge it into State Parks. From the outside it might make sense, but to OHV leadership in the state it is a huge step backward. During the first 12 years of the OHV program, it was managed by State Parks. There were lots of problems with that. OHV money was being spent on non-OHV stuff and we weren’t getting the attention we thought we deserved. So in 1982 the OHV division of State Parks was created. Since then, it has functioned well with its own funding (from green/red stickers and fuel taxes) and its own staff. A constant thorn in our side has been that the program expires every five or ten years and requires re-authorization. So when expiration time nears, we fight to get a good re-authorization. The problem with that is that environmentalists stick their noses in and try to steer money their way and screw with us. We are nearing that point again, as our program expires at the end of 2017. State Parks is behind in maintenance. From one to one and half billion dollars behind! Seeing that, OHV money looks pretty attractive. The average guy on the trail may not know, but California’s OHV program is pretty successful. It is self-funded, manages nine State Vehicular Recreation Areas (SVRAs) and gives grants to support other OHV throughout the State. We feel that merging with State Parks will do nothing to help the OHV program and will likely hurt it. It will probably help non-OHV parks, but they are not our problem. We feel the governor wants this and he can get it. For re-authorization to take place, legislation must be created and pass both the Assembly and Senate, then be signed by the Governor. All the Governor has to do is wait until the end of 2017. SDORC recently rejoined the California Motorized Recreation Counsel. The group is very concerned about what is going on with the program and I have to thank them for sharing information about this with me. State Parks recently began a process to stop all off-trail access (foot traffic) in state cultural and natural preserves and reserves. I wrote comments on this (you can read them on our Facebook page) and thought my part was done. Assemblyman Brian Jones wrote some very strongly worded comments and among other points, said they did this with no transparency or public meetings. So a few weeks later a public meeting was held in San Diego on this proposal. I’ve been to a lot of meetings with agencies; some have had more agency staff than attendees. This was not like that. The room chosen was way too small with 100 plus people trying to fit in a room made for 40. The meeting was two hours and anyone who wanted to speak was given two minutes. About 50 people spoke and every single person spoke vigorously against this proposal. There were people from the Sierra Club, various natural societies and other environmental groups, as well as jeep, motorcycle, mountain bike and rock climbing groups. All who commented were upset about being closed out of interesting parts of Anza Borrego Desert State Park (ABDSP). All told, this would close about 40,000 acres in seven areas in ABDSP. Speakers said that bad people would go in whether it was legal or not. Without good people there, bad people could get away with lots more. It was pointed out that there is no scientific evidence that these closures are needed. People were just mad that they were being closed out of places they liked to go. (Now they know how off-roaders feel!) I spoke near the end and talked about how ABDSP completed a Cultural Preserve Management Plan in 2012 (click here) and in the plan it stated that cultural areas should remain open to the public. My prediction is that State Parks will toss this ill-conceived plan, but we will find out soon enough. 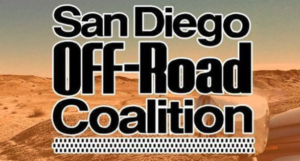 The San Diego Off-Road Coalition (SDORC) has monthly meetings at the Ranch House Restaurant in Lakeside on the first Tuesday of each month. At July’s meeting we had a number of interesting guests. Sergeant Amber Baggs from the San Diego County Sheriff’s Dept. came and spoke for a few minutes. Amber is head of the Sheriff’s Off-Road Enforcement Team. She talked a little about her program. She said they sold the motorcycles they used for patrols, but still have their ATVs, side by sides and SUVs. The biggest problem area they have is around Otay Mesa past the end of 905. She said when they patrol Lark and Corral Canyons, education is a priority over enforcement and she talked about the grants they receive from the State OHV Division. Neil Hamada attended and talked a little about the dunes. Neil is the BLM Recreation Manager for the El Centro office and it’s always good to see him. We had surprise visitors Assemblyman Brian Jones and his staff member Gail Remer. Brian presented me with certificate of recognition for the work I have done. Jim and Roberta Woods came all the way from Simi Valley. Jim is a current CORVA director and former president of both CORVA and AMA D37 Dualsport and Roberta is a former CORVA treasurer. 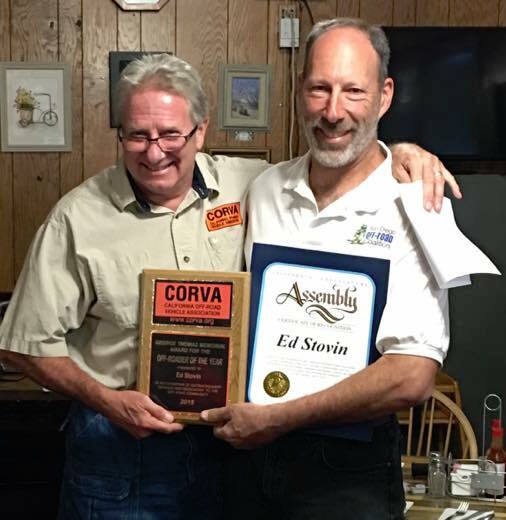 Jim awarded me the plaque for CORVA’s Off-roader of the Year.